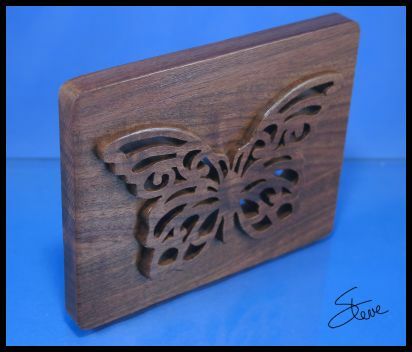 Butterfly Bevel Cut Scroll Saw Pattern. This is a small piece. It is six inches wide and five inches tall. The butterfly is a bevel cut that allows it to come forward and look like it was carved from the wood. Using this technique the grain of the wood has a continuous look. It looks different than if the butterfly was cut from another piece and glued to a backer board. This piece is a good example to ask this question. Is it art or craft and why should we care. I had a piece of wood. I turned it into an object that I think is pleasing to look at. Is that enough to make it art? The line between the two words is very fuzzy. From the Oxford Living Dictionary. An activity involving skill in making things by hand. These two definitions can clearly be melded together. Let's look at today's project. Is it an expression of human creative skill? Was it designed primarily to be appreciated for its beauty? I think we can answer these questions with a yes. Does it involve a skill in making things by hand? Again I think that's a yes. So by the definitions, I think we could easily say this is art. Now it get's trickier. Most people will subconsciously define art as a piece that requires a greater level of skill and creativity to produce. They want to know that the artist had total control over the design and inspiration of the piece. They set art to a higher standard even if they can't define that standard. Today's project can be cut from a pattern. It can be cut by anyone with modest scroll saw skills. Most people will consciously or sub-consciously consider this a craft project for those reasons. Most people will assume that the artist is more highly trained and skilled. This will not always be true but that is the stereotype. This debate only comes up for a couple of reasons. Pride and money. I don't mean either in a negative way. Some people want to consider what they do as art because they know the stereotype of art is more valuable. I tell people all the time to treat every piece they make as a one of a kind heirloom piece of art. I am usually telling this to people who are trying to sell their work. It's just good marketing. I personally do believe that there is a difference between art and craft. I have never looked at a Monet and said he was a fine craftsman. I say he is an incredible artist. The truth is he is both but I define him as an artist because of the level of the work. Is there any reason for us to care if what we make is art or craft? For most of us, I don't think it really matters. We enjoy the process of making things that can be enjoyed by others. Time is ticking. The Woodworking Show of Texas is just days away. I am super excited to have the opportunity to be the guest of Bear Woods at the show. They have kindly invited me to join them in their booth. If you have the chance to attend the show I hope you will stop by and say hello. Looking at the vendor list shows me that this will be a great show to attend. You will have the opportunity to talk with the vendors personally and see the machines and supplies up close. Many of us live in areas where we only get to see some of these products online. I like to pick them up and feel the quality.